Running Press Adult, 9780762456628, 200pp. From quinoa to bulgar and millet to kasha, whole grains are an easy and tasty part of every balanced meal! 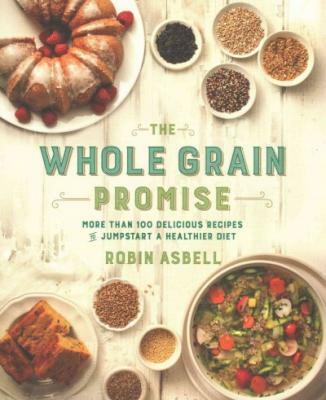 In The Whole Grain Promise, Robin Asbell shares quick and easy whole grain recipes that will entice the pickiest eater and appeal to the whole family. Whether you want to improve your health or try something new for dinner, whole grains are the perfect place to start. Beginning with the basics, Robin takes you through the major types of grains, their health benefits, and how best to cook them. But the real meat of the book contains more than 100 mouthwatering recipes that will encourage everyone to embrace the whole grain diet. The Whole Grain Promise will tempt your family with food that's not only healthy, but delicious for everyday meals! Robin Asbell's writing has appeared in Better Homes and Gardens, Real Food Magazine, VegNews, Clean Eating Magazine, and Vegetarian Times. She has written five previous cookbooks, including The New Whole Grains Cookbook and Big Vegan. Asbell lives in Minneapolis, Minnesota. "The recipes are smart, flavor-forward, reliable and simple, with suggestions for making dishes ahead and using up leftovers. The book delivers in numerous satisfying ways--and with more than 100 recipes"